Though we’re known for our putting greens and our ability to transform backyards and lawns, commercial applications are our fastest growing category. From apartment complexes and living facilities to rehabilitation centers, golf courses, driving ranges, and even mobile home parks, commercial facilities of all stripes are finding the year-round aesthetic beauty, durability, and safety of our synthetic turf from Southwest Greens appealing. Safety and durability are hallmarks of our synthetic turf; so much so that day care centers and school districts across the country depend on it to keep children safe during recreational playground activities. Kids like to run and jump, and as a result they have their share of falls. Because our synthetic turf installations are tested at the highest levels and exceed G-Max demands and specs, the severity of injuries from falls off of playground equipment decreases exponentially. Did you know that Southwest Green’s artificial turf’s influence has spread beyond the golf course and across the sports spectrum? Our synthetic turf is the turf of choice at the Surprise, AZ spring training home of Major League Baseball’s Texas Rangers, and the fact that it can withstand the heavy traffic and warm climates of spring training in Arizona speaks volumes. Corporations including AOL, Taylor Made, and SRP (Salt River Project) have also turned to our turf for their corporate installations. Five-star resorts and hotels spare no expense to satisfy customers, so when they choose Southwest Greens to install on-site putting and chipping greens it speaks to the durability and beauty of our products. No less than the Pointe Hilton Squaw Peak in Arizona, the exclusive Shore Club in Miami, the Westin Regina in Los Cabos, and Royal Caribbean Cruise Lines, LTC count on our putting greens for optimum play, and so should you. 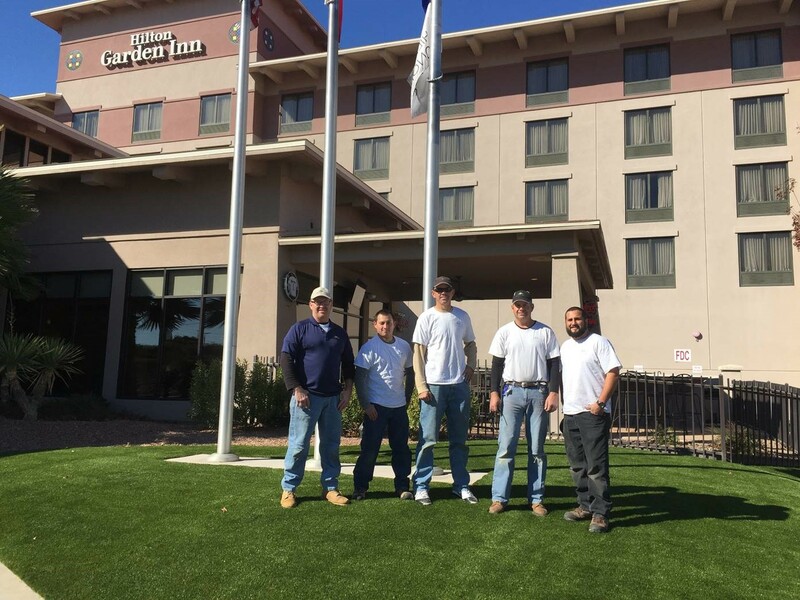 Southwest Greens became the preferred vendor for Hilton Hotels worldwide and completed installation of Turf at the Hilton Garden Inn in El Paso, TX earlier in 2016. Southwest Greens of Florida has recently completed three installations a three Waldorf Astoria’s in Florida – a Hilton Brand. Just recently, Southwest Greens of New Mexico attended the Southwest Greens International Leadership conference to discuss industry trends, new products, and new projects. It was great to see 10,000 ft2 of a new turf design recently installed at the Las Colinas Sports Club, a five star resort and private club and Host of the Byron Nelson Invitational.